GREAT LOOK: Just when you think your child can’t get any cuter, here comes C.C .KIDS. pom beanies. This thick, ribbed knit pom hat will keep your kid so warm and cuddly, you will want to see your cutie-pie in each color! Beautifully designed, this unisex kids’ beanie cap will look fabulous on your little angel and is perfect when the weather turns from warm to snuggly. Great to throw on with everyday outfits and can add pop of style and fun with some cute boots or a winter coat. GREAT FIT: One size. The fit ranges from babies and toddlers to kids and children. Measures approximately 8″ x 8″ lying flat (plus a 4″ diameter pom). Children’s Hat size 6 to 6-3/4, ideal for many kids age 2-7. The beanie has plenty of stretch for growing into and getting multiple years use. Keep your little one warm, cozy and having a look adorable in this colorful, ribbed knit hat. With a fun pom on top, and a couple of color options, get the lovable look of the exclusive CC basic solid color beanie and keep your sweet kiddo snuggly in the fall and winter weather. Super cute, and helps to make your child easier to spot in daycare or playing outside. A great, quality accessory for tots and kids alike with the CC .KIDS. logo. GREAT LOOK: Just when you think your child can’t get any cuter, here comes C.C .KIDS. pom beanies. 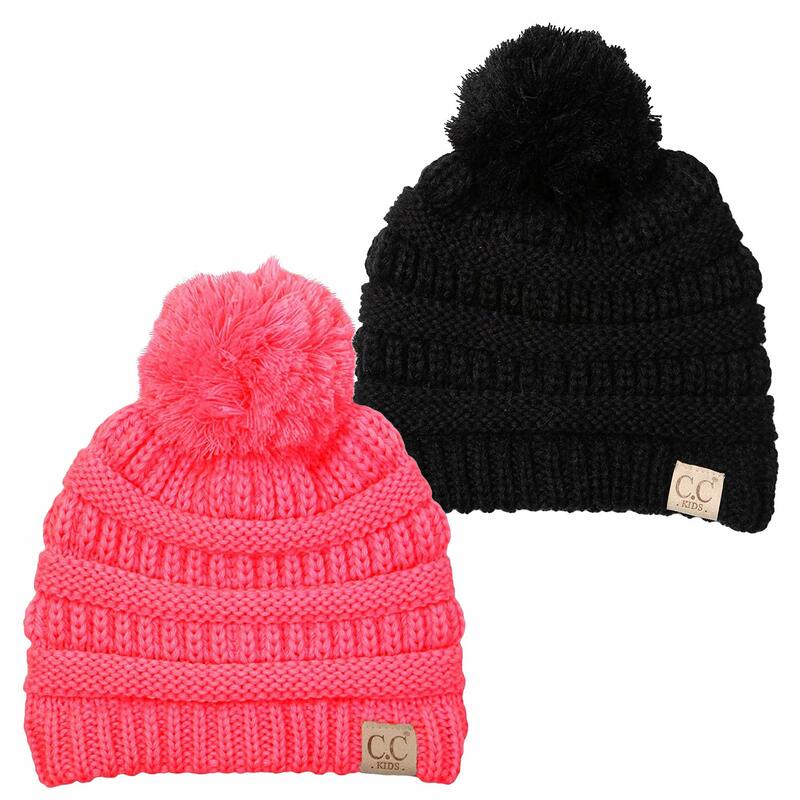 This thick, ribbed knit pom hat will keep your kid so warm and cuddly, you’ll want to see your cutie-pie in each color! Beautifully designed, this unisex kids’ beanie cap will look fabulous on your little angel and is perfect when the weather turns from warm to snuggly. Great to throw on with on a regular basis outfits and can add pop of style and fun with some cute boots or a winter coat. GREAT FIT: One size. The fit ranges from babies and toddlers to kids and children. Measures approximately 8″ x 8″ lying flat (plus a 4″ diameter pom). Children’s Hat size 6 to 6-3/4, ideal for many kids age 2-7. The beanie has various stretch for growing into and getting a couple of years use. WHEN TO WEAR: Throw this soft hat on your youngster for any chilly outside activity. Perfect for a cool, breezy day in addition to in the freezing cold winter. Great for the playground, at a pumpkin patch, all over Christmas season, in a stroller, at a parade, on a play date, at school or in the most efficient spot…cuddled in your arms. Also makes a great birthday present or stocking stuffer!